West Michigan is an ideal location for runs and races. Right along the shores of Lake Michigan, Ludington features many beautiful roads beside the lake, through downtown Ludington, and on the way out to the State Park along the sand dunes. 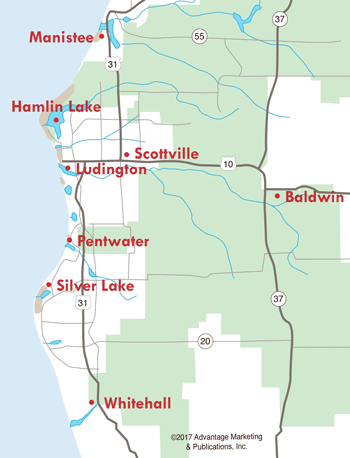 There are races in Ludington's surrounding areas, as well, featuring more lakefront views and rural settings. Below, you will find dates and information for more annual fun runs and races in Ludington and the surrounding areas. The Annual Amazing Grace Race to benefit Covenant Christian and Ludington Area Catholic Schools is held in May near the Hamlin Dam at Ludington State Park. The event includes a free, one-mile fun run for kids only and a 5k open to anyone. Admission for the 5k is $25 per runner and there are prizes for the top five finishers for men and women. Hot dogs, chips, and water will be available for purchase. Pre-registration is required for all 5k runners as well as one-mile fun run participants. Please contact the Covenant Christian School office at ccsoffice@ccs-ludington.org with any questions. Spectrum Health Ludington Hospital hosts this annual event. The 2017 race starts at 10 am, and begins and ends at the hospital's south parking lot, 1 Atkinson Dr., Ludington. A free will donation will be accepted from participants and all proceeds benefit the Family Birthing Center at the hospital. Visit spectrumhealth.org for more information. The Silver Lake Edition is the largest adventure race in the U.S. The Silver Lake Edition is a race of extremes. Participants traverse Sahara-desert like dunes one minute and the expansive waters of Lake Michigan and Silver Lake soon after. In addition to great orienteering, trekking, and biking, unique physical challenges like paddleboarding and sandboarding at the Silver Lake State Park are also included. The five or eight hour experience has solo, two or three person co-ed, female and male teams. Swag includes tech shirt, huge raffle and top prizes, and a pizza lunch. 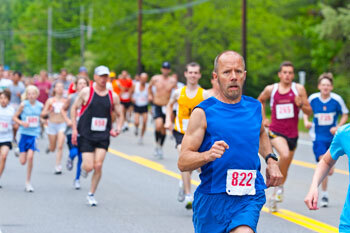 Since 1980, Ludington has been the host for the well known Ludington Lakestride 5K, 10K & Half Marathon. The weekend begins with a one-mile fun run on Friday evening at 6pm. Saturday's Lakestride is actually three races: the 5K run which winds its way through Cartier Park, the 10K which runs out to Decker Road and back, and the Half-Marathon. Read more about the Ludington Lakestride. The Stony Lake Sparkler 5k benefits the Crystal Valley Care Fund. The race begins at Stony Lake Inn- 4722 Scenic Dr. in Stony Lake, and also includes a 1 Mile Fun Run/Walk. All 1 Mile Fun Run/Walk participants will receive an award and there will also be special awards given to Largest Family and Best Spirit Costume. The 1 Mile Fun Run begins at 8am with the timed 5k kicking off at 8:30am. Registration are generally $25 for the 5k, $15 for the 1 Mile Fun Run, and $70 for a family of up to 2 adults and 4 kids living in the same household. T-shirts are guaranteed for those who register early. Late registration cost is usually $30 for the 5k, $20 for the 1 Mile Fun Run, and $80 for a family. There is a post-race party at Stony Lake Inn which includes fun, food, and music. West Shore Community College hosts a Muddy Fox Trot, a family-friendly 5k mud run with a boot camp style obstacle course. Scheduled in July and starting at 10am, the run benefits the WSCC Foundation student scholarship fund. Registration for adults is $20 and includes lunch. Current WSCC students with a valid student ID will be able to enter the race for free, as well as anyone 16 years or younger. The course challenges runners of all levels. All participants will receive a free t-shirt and complimentary lunch. A food concession will also be available to spectators. The annual Ludington Lighthouse Triathlon happens each August in downtown Ludington, where the Avenue ends right at the beach. The event includes biking, kayaking, and running and participants can choose from 6 different race combinations. Pentwater's Charles Mears State Park hosts a 5K and 10K beach walk/run to benefit COVE each summer. The course covers paved, sand, and beach surfaces. The mission of COVE (Communities Overcoming Violent Encounters) is to provide shelter, advocacy and protection to victims of domestic and sexual violence and other homeless women and children, and to educate our communities about the root causes of violence. Check-In and Registration begins at 7am. The Fun Run begins at 8am with the 5k/10k kicking off at 8:30 am. There are awards and prizes in many divisions and all participants will receive a finishers medal. Cost is generally $10 for the 1-mile fun run with registration on the day of the event, $25 for the 5k/10k early registration, and $30 for late registration. New in 2018, was a Virtual 5K Run/Walk, Registration was $25 anytime through August 3rd. Virtual participation took place July 28th - August 11th to best fit your schedule. After completion, participants were instructed to take a selfie and post it on COVE social media. For more information, contact Lynn Cavazos at (231) 869-5939 or lcavazos5939@charter.net. This was a new race in 2018 as part of the #RunLudington Race series. The race begins at the Ludington Pub- 209 S. James St. at 9am and the track includes sand dune and beach running so jogging strollers are not recommended. Registration fee is generally $25 which includes a custom die cast finishers medal, race swag item, coupons, and chances to win prizes (race winners and random drawings). Race day registration begins at 8am on August 4th at Ludington Pub. Dogs are not allowed in this race. The annual Rich Tompkins Memorial Run/Hart Healthy Labor Day 5k, Youth Mile, and Bridge Walk is held each Labor Day beginning in front of the Hart Main Street Office at 49 S. State Street in Hart. Race day check-in and registration begins at 6:30am. The 1-Mile Youth Run registration is $17 and begins at 8am. 5K Run/Walk registration is $25 and begins at 8:30am. 2.2 Mile Bridge Walk registration is free or $15 w/ a t-shirt and begins at 8:45am. Call the Hart Main Street Office at (231) 301-8449 or visit www.hartmainstreet.org for more information. This event is held annually to benefit the Food Pantry at St. Ann's Senior Center in Baldwin. The race features a 5k and 10k through spectacular Michigan forests. The 5k is mostly along flat, paved surfaces with one large hill. The 10k is for serious distance runners and will go along unpaved trails in hilly wooded forest. Registration is generally $25 until September 9th and $30 from then until the event. All registrants will receive a t-shirt, while supplies last. Register at Pandora's Box- 855 Michigan Ave. in Baldwin or online at salmonrunbaldwin.com. This annual 5k/10k/Marathon/fun-walk/run begins at 10am at James Street Plaza- Corner of Ludington Avenue and James St. in downtown Ludington. Participants are encouraged to dress in costume. Proceeds benefit the Love Ludington Fund and all pre-registrants receive a glow-in-the-dark t-shirt. The first 100 finishers receive a custom medal. Spectrum Health Ludington Hospital and Win with Wellness sponsor the annual race which takes place at 8am on Thanksgiving morning. The 5k fun run/walk starts at the Cartier Park parking lot at the corner of Rath and Bryant in Ludington. There is no charge to participate and all ages and fitness levels are welcome to attend. Festive attire is encouraged! Fit Club students will earn miles toward the 100 Mile Challenge for participating in the Turkey Trot. Presented by Spectrum Health Ludington Hospital's Win With Wellness Program, this race takes place at 11am in downtown Ludington each New Year's Day. Cost to run is $25 and very finisher receives a custom 3.5" die cast metal. Students who participate in the Win With Wellness Program run free. The race begins and ends in front of Pentwater School- 600 Park St. with the 1 Mile Fun Run kicking off at noon and the 5k to follow. Pre-registration (by January 31st) is $15 for the fun run and $25 for the 5k with proceeds benefitting the Pentwater Cross Country and Track Teams. Pre-registrants will receive a race t-shirt. On-site registration begins at 10am the day of the race but no t-shirt will be guaranteed. All pre-registrants will receive a t-shirt and finishers medals will be awarded to all 1 mile fun-run participants (only guaranteed to pre-registrants). Medals will be awarded for the 5k to the 1st and 2nd place runners in the following age categories: 0-14, 15-19, 20-29, 30-39, 40-49, 50-59, and 60+. Hot chocolate, post race snacks, crafts for kids and entertainment will be provided indoors after the race. This RunLudington event includes a 1-Mile Fun Run starting at 9am, 10k at 9:10am, and 5k at 9:15am. The route and location is yet to be determined and cost is $25 for the 5k and 10k, with the Fun Run being free. Finishers will receive a custom medal. Ludington is also home to the Ludington Pub Run Club which meets every Tuesday at 6pm at the Ludington Pub- 209 S. James Street for a fun run of about 3 miles. Runners of all levels are encouraged to join in the run and socializing after the run.